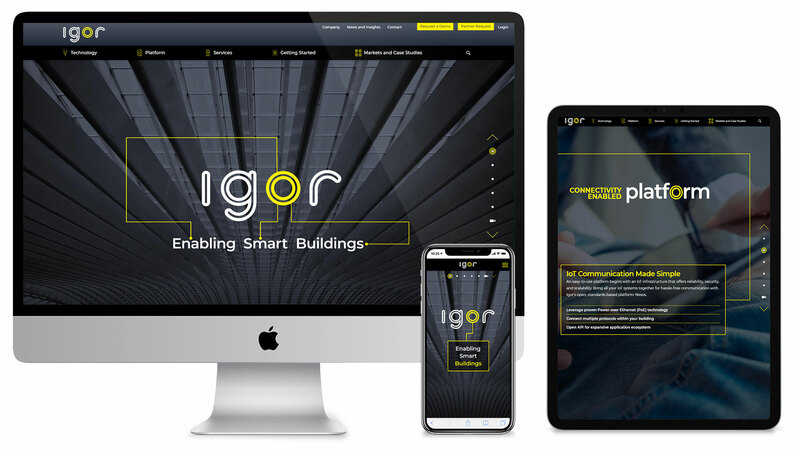 A truly innovative website boldly and positively represents your organization and makes your team proud to be part of the brand. It shares your story, draws in new visitors and keeps them engaged. Your site captures the user’s attention via creative website design, valuable content and intuitive user experience (UX) while being fully optimized for every web browser and mobile platform. It brings conversions, results and a true ROI. Blue Compass has a history of being an award-winning responsive web design and development company that creates custom designs that boost visits, UX and conversions. Blue Compass websites are built to be easy to find, simple to navigate and effortless to update. Our Iowa web designers understand your site isn’t a billboard; it’s a road your company and customers are traveling on, and we make sure it’s a four-lane highway to online success. For each website Blue Compass launches, our goal is to increase traffic, boost brand awareness and generate more conversions. We utilize proven user experience best practices and offer UX consulting to ensure your new website design meets your online goals and follows the latest UX design trends. The team members who build our websites aren’t just website designers, programmers or developers; they are web experts. These Des Moines web experts conduct monthly meetings which discuss researched industry topics and how to utilize new breakthroughs with Blue Compass standards. Our Iowa web development, design and digital marketing teams work together daily to inspire and challenge each other, making them the best in the business. They understand the latest responsive web design trends and how visitors will interact with your site. They’re also aware that not everyone on your team is a web expert, so when we’re creating a website for you, it will be easy to manage and update on your end, and seamless to use as a visitor. Our responsive web design company begins every web design with UX research and strategic planning. 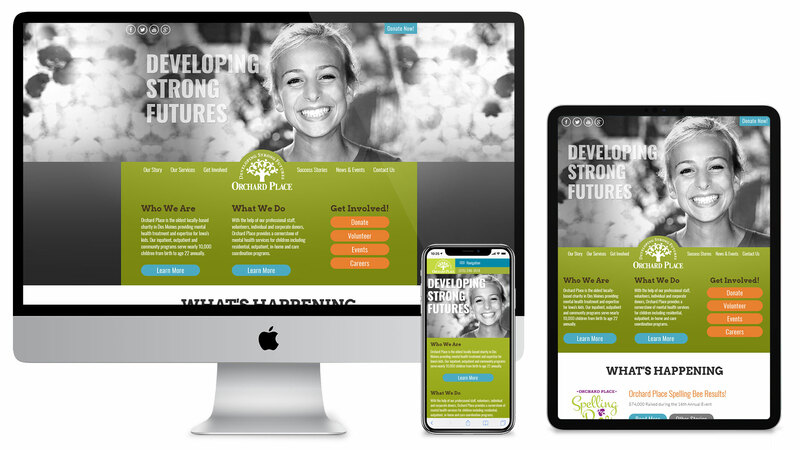 Our Iowa web designers get to know your organization’s goals and priorities for your site, then carefully examine your brand, industry and competitors. During the planning process, we also offer market research options to help your business learn more about your customers, their opinions and your company's position in the industry. This detailed planning results in a unique look that incorporates the latest UX design trends and perfectly represents your brand and captures the attention of your target audience. You will not find any pre-designed templates here. When creating a website, the Blue Compass design team starts from scratch on every website. Your brand is unique and deserves a one-of-a-kind website design that represents your organization. A professional, engaging layout will reflect your brand and instill trust in your visitors. First impressions matter; it only takes a split second for a visitor to click away from your site and move on to your competitor. Without an attention-grabbing design, your site's ROI is limited. Our web developers and designers are experts who understand UX and SEO best practices. Responsive web designs are mobile-friendly, meaning they conform to the size of the screen they are viewed on. This adaptability gives your website visitors an optimal experience, whether they are on mobile, tablet or desktop. If you're looking for a responsive web design or accelerated mobile pages (AMP), our responsive website development company has the solutions you need. Our dedicated team of web designers works hand-in-hand with the digital marketing team to ensure all designs are created with search engine optimization (SEO) best practices in mind. We develop our websites and content management system (CMS) to be incredibly search engine friendly. Additionally, our Iowa web development team makes sure your responsive web designs are cross-browser and cross-platform compatible (Windows, Mac OS, iOS, Android, Chrome, Firefox, Safari, Internet Explorer, Opera, etc.). Our goals are the same with any new site launch: we want to see our clients’ websites not only increase in rankings and traffic but in conversions, as well, since that’s what will translate to ROI for your team. When you succeed, we succeed. Before our web designers start to design your new website, we sit down with your team and review your goals, target audience, competitors, products and services. We also discuss website features your team likes or feels are needed in the site, such as database storage of contact form submissions, payment processing, custom forms, newsletter systems, calculators, or pretty much any other custom development your team or your clients would benefit from. Our Des Moines web design team looks forward to checking off your online wishlist. After this kick-off meeting, our responsive website designers and UX agency members complete market and competitive research to determine the visuals and UX design trends that will perform best for your industry. From there, we create a fresh homepage design, created specifically with your audience and brand in mind. After receiving your feedback, we work together to make any changes until you are completely satisfied with your new homepage design. After your homepage design is approved, our designers move into interior pages and custom app designs. We follow a similar process working with your team on any updates and tweaks to ensure these pages end up capturing your vision and captivating your audience. Before launching a new site, our Iowa web development team performs rigorous testing on numerous devices and platforms. On launch day, we work through four different launch checklists for the Digital Marketing, Account Executives, Front End and Back End teams, containing both pre- and post-launch elements. All this is done to ensure that your site launch is a seamless and well-received change for its visitors, both on your team and amongst your clients. With Blue Compass' web development services, your site will be customized to your exact needs. 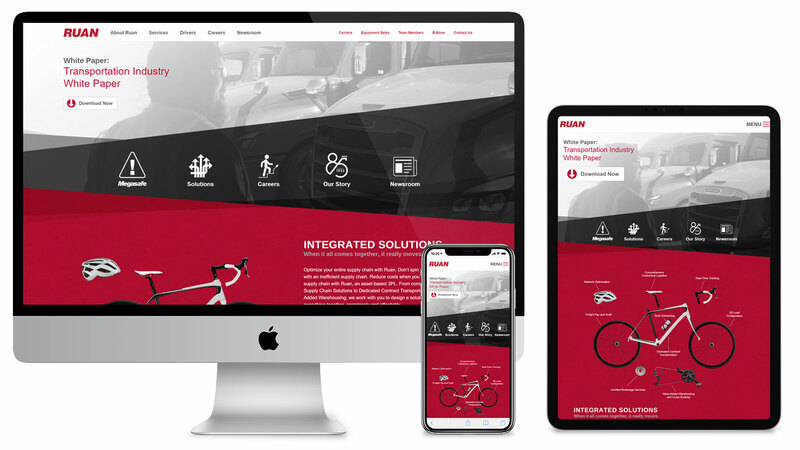 Business owners from industries across the board, including athletics, transportation, medical and many more have trusted our responsive website design and development company to meet their individual website needs and yield significant results for their brand and benefits to their consumers. We’ve provided everything from newsletter tools, to shopping cart storefronts, to HR management systems, and everything in between. We even offer a custom SaaS Intranet for your internal communication needs. 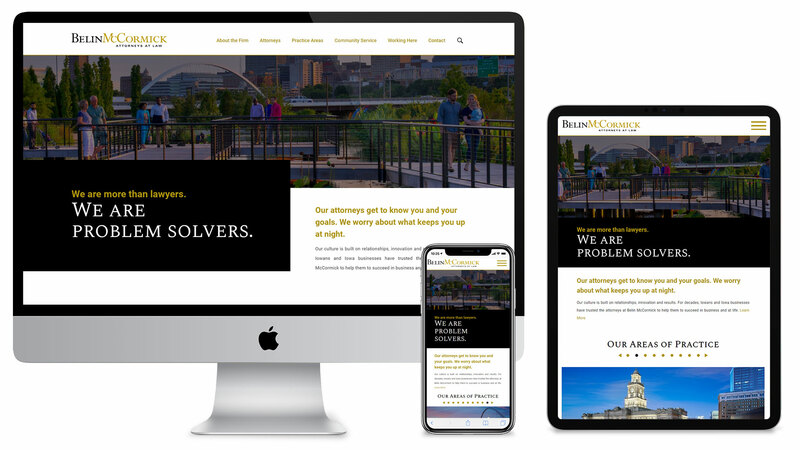 Whether you're located nearby in Des Moines, Iowa, or across the country - our web developers and designers in Iowa have the best website design solutions you need. We are proud to have produced many award-winning designs that have been honored by prestigious organizations such as Adobe, The American Design Awards, The Communicator Awards, The American Advertising Federation, The Horizon Interactive Award, The Iowa Women of Innovation Award and the PRSA Award of Merit. 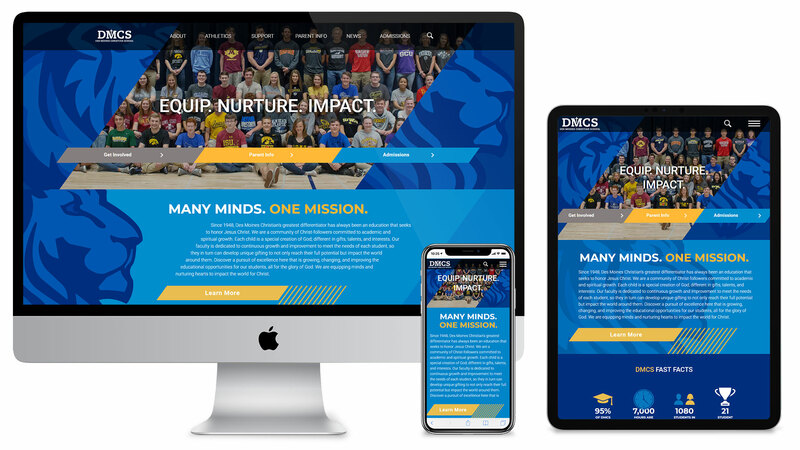 Whether you’re in need of a design refresh, a new piece of functionality or an entirely new experience, Blue Compass is a responsive web design company and UX agency with services that can bring your vision to life. Contact us today for a free quote!